1993-2002 Attendance figures are for Veterans Stadium. On June 3, 2002, Lincoln Financial Group proudly announced a major new partnership with the Philadelphia Eagles Football Team to name its new state-of-the-art 66,000-seat stadium Lincoln Financial Field. Lincoln Financial Field is currently under construction and is destined to become the premiere sports and entertainment venue in the United States. The stadium will open its gates and embrace the public in August 2003. The sponsorship positions Lincoln Financial Group as the premiere partner of the Philadelphia Eagles National Football League (NFL) football franchise. It includes prominent signage on the stadium exterior, interior and parking lots; hospitality opportunities at home and away games as well as training camp, community sponsorships and includes a kiosk at the stadium and promotions with Philadelphia Eagles players, coaches, and cheerleaders. Under terms of the deal, Lincoln Financial Group will invest $139.6 million over the next 20 years, through annual payments averaging approximately $6.75 million. In return, Lincoln Financial Group will become the prime corporate partner of the Philadelphia Eagles and receive a wide range of marketing benefits. Lincoln Financial Group's funding for this initiative comes from already committed marketing expenditures and compares favorably to other major market sports sponsorships, such as FedEx Field in Washington, D.C., which cost $7.6 million per year over 27 years. Lincoln Financial Field is an excellent, high profile branding and marketing opportunity for the company, employees, planners and shareholders. Stadium entitlements are a proven way to build strong brand name awareness based on evidence from other major markets and sports teams. NFL Football is the most popular U.S. sport with 73% of all Americans watching regular season games, according to ABC News. It is also a sport with a higher percentage of affluent consumers than any other sport ... higher than baseball or golf, for example (per an ESPN 2001 sports poll).The Philadelphia Eagles play in the National Football Conference (NFC) East Division, which has four of the top eight media markets in the country: New York, Philadelphia, Dallas and Washington, D.C. Each televised home game at Lincoln Financial Field will reach approximately 11.5 million U.S. households. Part of Lincoln's naming rights sponsorship is an integrated marketing platform, which includes a unique opportunity for Lincoln Financial Advisors' planners to conduct financial seminars for Philadelphia Eagles players, coaches and staff. In addition, Lincoln Financial Group will be the official provider of a wide range of financial products and services such as retirement products, life insurance, managed accounts, 529 plans, institutional investments, and financial and estate planning. Lincoln Financial Group has a long history of active corporate citizenship. Through the Lincoln Financial Group Foundation, we provide funding to many Philadelphia-area non-profit organizations, including the Kimmel Center for the Performing Arts, Franklin Institute Science Museum, Project Home, YMCA, United Way and Ralston House for the elderly. Our partnership with the Philadelphia Eagles represents a natural evolution in our commitment to the region. Our investment in the new Lincoln Financial Field reflects our tremendous pride and steadfast commitment to our new hometown and to the greater Philadelphia region. This partnership will enable Lincoln Financial Group to expand its existing relationship with the Eagles Youth Partnership (EYP), the charitable wing of the Philadelphia Eagles. Tackling children's health and education issues, EYP connects the Eagles organization and its players with corporate and community partners to deliver services, grants, incentives and messages to children that positively influence their lives. This organization promotes programs in the area of children's health and education, such as the Eagles Eye Mobile, the Eagles Book Mobile, and the Eagles Community Playground Build. Lincoln is dedicated to many of the same values as the Philadelphia Eagles organization, including integrity, commitment to excellence, fairness and responsibility. These shared values support a winning investment made between two outstanding organizations that extend beyond their respected fields. Seats that are dramatically closer to the playing field: Seats along the sidelines in the new stadium will be 60 feet from the field vs. 120 feet at Veterans Stadium. Nearly twice as many seats in prime, sideline locations: Two-thirds of the seats will be located along the sidelines in the new stadium. By comparison, sideline seats at the Vet, built in 1971 in the cookie-cutter, multi-purpose design popular at that time, constituted only one-third of the seating. 20 percent more lower-level seating: In the new stadium, 60 percent of the seats will be in the lower bowl, a dramatic improvement over the Vet where at present only 40 percent of the seats are in the lower deck, the worst percentage in the NFL. And, again, only one-third of those seats in the Vet's upper deck are along the sidelines. No obstructed-view seats: Dramatically improved sightlines and no obstructed view seats will represent a major improvement over the aging Veterans Stadium. Larger seats: In some areas of the new building, the actual width of the seats will increase from 19 inches to 23 inches. All seats will feature cup holders. Video Board - The new stadium will feature two state-of-the-art liquid-crystal display video boards each measuring 27' x 96'. The HDTV, flat-screen technology boards, each of which will span nearly the entire width of the field and will be situated between the upper and lower seating areas in both the north and south end zones. Each new screen will be the equivalent of four Phanavision screens. As such, every fan will now have an unobstructed view of the biggest and most technologically advanced video boards in operation. By comparison, Veterans Stadium is home to just one early 1980s model video display board (31' x 42'), a screen located in the upper deck, out of the line of sight of a significant number of patrons seated in the stadium's lower level. Sound System - The new building will feature a "distributed sound" system composed of several hundred small speakers strategically and scientifically located throughout the entire building in order to provide a state-of-the-art, crystal clear, surround-sound quality. The high-tech system will enable announcements to be delivered to specific sections. The new Lincoln Financial Field will feature a plaza area of over 100,000 square feet. This is significantly larger than that of both Eutaw Street (beyond the right field wall at Oriole Park at Camden Yards) and the plaza area beyond the center field wall of Turner Field, home to baseball's Atlanta Braves. A 15' x 20', high-definition video board/sound system so that those attending pre-game parties and functions will have an opportunity to watch early-afternoon games or special productions. Multiple stage areas for bands. A highly visible area from which the club's flagship radio station may broadcast pre and post-game shows. A host of interactive activities. In a dramatic departure from the confines of the Vet, the new Lincoln Financial Field will include 9,000 Club Seats that will allow patrons to experience events and entertain guests in maximum comfort. Club seats, set in prime sideline locations, will be extra wide and padded. Club patrons will also enjoy waiter service. The Club Seats will be accessible from a luxurious, air-conditioned club level that will house lounge seating, sports bars, video walls, and will feature a pre-game buffet. The number and location of the luxury suites at the new Lincoln Financial Field will represent a significant improvement over the suites controlled by the Eagles at Veterans Stadium. The suites in the new stadium will be located between the lower bowl and the club seating sections as well as between the club seating section and the upper bowl. The lower level of suites will be among the closest to the field of any NFL stadium. By comparison, the suites controlled by the Eagles at the Vet sit atop the stadium, further from the field than any other suites in the league. Each of the suites will feature retractable glass windows, allowing fans the opportunity to watch the game in climate-controlled comfort or with the open-air experience. Suite-holders will enjoy premium parking, an exclusive entrance, specialized catering, personalized concierge service and elegant interior designs. The Eagles' new stadium will feature a significantly higher ratio of rest rooms per fan than was the case at Veterans Stadium where there is a ratio of one facility for every 319 men and one for every 92 women. Urinals for males in upper seating area: 1/77 patrons. Toilets for females in lower seating area: 1/57 patrons. Toilets for females in upper seating area: 1/58 patrons. The new stadium will include over 2,300 rest room fixtures, including urinals, toilets, and sinks. The concourse width will be double that of Veterans Stadium, increasing to 60 feet in most places and 90 feet in some areas, all in an effort to make fans' movement to and from seating areas, concession stands, and rest rooms as easy and comfortable as possible. The stadium will feature 308 points of sale for food and beverages at nearly 100 concession stands built into the stadium. In addition, an as yet undetermined number of portable kiosks also will cater to the needs of fans. A wide variety of merchandise also will be available at nearly 10 novelty stands and a "team store." Two (2) complete commissaries will provide fans with first-class fare, ranging from the traditional ballpark menu items to a variety of fresh, new options. One commissary will service the concession stands while the other will provide for patrons in the Club Seating and Luxury Suite areas. 15 escalators, including 3 that reach the upper seating bowl, will service various sections of the stadium's six levels. Now fans wanting to reach the upper seating areas will have far greater ease of movement. 9 passenger elevators will be available to patrons while 3 service elevators will handle the needs of the event staff. Traffic studies and pedestrian studies will create better access to and from the new stadium, thereby making the overall day-of-game experience better and more enjoyable. The number of available parking spaces in the entire sports complex area will increase from 16,000 spots to nearly 22,000. The wing-like roof structures will, in addition to adding to the overall aesthetics of the building, serve a number of purposes, including... providing an improved degree of covering for fans in the event of inclement weather, adding to the game experience by channeling the noise back into the stadium itself. The Eagles locker room, including training and equipment rooms, will be over 14,400 square feet (96' x 150'). The visiting football locker room, including training and equipment rooms, will be 80' x 90'. The stadium will also house two flexible-purpose locker rooms, each being 100' x 64'. October 5, 2003 & November 12, 2006 - Philadelphia's long history as an NFL franchise has spanned a number of different venues around the city, from the Baker Bowl to Shibe Park to Franklin Field and the Vet, and the opening of "The Linc" represents a watershed moment in the franchise's history. This $520 million venue incorporates the essence and flavor of this community and its passionate football fans in a big way. Finding any of Philadelphia's sporting venues is an easy task - their "sports complex" is located about 3 miles south of downtown, and not too far from the airport, and auto access is via I-95 and I-76... just follow the signs to the proper exits. South Broad Street is the major street thoroughfare going by the complex, and their subway line has a station about 3 blocks away from the stadium. Parking here is a bit of a chore, and even though the area abounds in surface lots, both on the premises and private lots, there is a bit of a crunch that will be alleviated once Veterans Stadium is demolished and cleared and configured for parking. For now, the lots closest to the Linc are reserved for permit holders - red lot, blue lot, you get the picture. Cash lots run from $10 to $20 and pricing has more to do with ease of access and post game getaway than proximity to the venue. Other than parking, there is little to see or do right outside the stadium in terms of ambience or entertainment. South of the sports complex is the overhead I-95 expressway and to the east are warehouses and shipping yards. To the west is a golf course. That leaves a high rise Holiday Inn and its sports bar as just about the only pre/post game destination. On our first visit here we were really appalled at the stringent prohibitions regarding tailgating. Officers were angrily patrolling the lots, issuing summonses for anyone sporting a grill and sniffing open containers for a whiff of alcohol. Gratefully, there was no sign of this nonsense this time around, and we were very impressed with the abundance of tailgaters, the decorated cars and buses, and the festive atmosphere outside the stadium. As it should be! From a distance the stadium looks quite impressive - a mammoth grey and black steel structure with glass accents, and a main entrance at the north end with bright red "Lincoln Financial Field" marquees on all sides. Walk into the main entrance for this is where the action is - a huge public plaza with such amenities as canopied concession stands, a giant jumbotron video screen, an outdoor stage featuring live entertainment, ticket offices and team merchandise store, and the main lobby to the stadium itself, called the "Head House", a stupendous atrium with large historic murals, a timeline display of the team's illustrious history, and a detailed mosaic tiled artwork of an eagle centered on the floor. Concourses here are incredibly spacious, for the most part, and from the main level there are viewing areas of the field in opposite corners. The color scheme here is a minimalist black, silver and grey, and more splashes of color would do a lot to brighten things up. There are escalator towers on three sides of the building, and elevators serving the club and suite levels. The upper concourse is open air, and the best views of the adjoining sports venues and the city skyline can be enjoyed from the west side. The stadium's seating bowl is the best part... three levels of seating, the lower and upper decks green seats and the club deck grey. Each end zone sports a massive 26 x 96 videoboard which looks that much larger since it is situated closer to the field. Digital LED strip boards run across the sidelines, and dot matrix boards showing game information and out of town scores can be found along the upper balconies. Roof canopies across the top of the upper deck were designed to look like eagles wings. The signature element of the seating bowl, however, is a tall tower located in the north end zone. This tower simulates the look of an eagles nest, complete with a screened murals of an eagle preparing to land right above the round deck. A cool viewing area from that vantage point and a digital ticker board wraps around the "nest". The food stands here bear local themes such as "Liberty Grill", "Market Street Deli", and "Penn Pizza". Of course, the famous Philly cheese steak is a must do when visiting here, and is available at just about all the stands. Another recommendation is the fresh baked pretzel, warm and soft with your choice of toppings. Asian food, cannoli, chicken sandwiches, espresso, beers of the world... you name it! But we were told that the thing to try here is Sid Booker's fried shrimp. Sid's secret recipe is a tried and true Philadelphia institution and only available at two locations in the city. There is a main team merchandise store in the north end zone "Head House" area, but many smaller merchandise kiosks and even stores can be found scattered throughout the venue. Lincoln Financial has some sort of branch in the north end zone... we don't know what's up with that, except some guy who was a dead ringer for Honest Abe was hanging out there and probably selling life insurance or something. Club seating can be found on the east and west sides, with the east club also wrapping around the south end zone. A number of levels of suites can be found above the lower and club levels, with a "red zone" suite section in the north end zone. By the way, PSL's are a requirement for lower and club seats, and club seating here runs well into 3 figures per ticket. We are starting to see a trend in the new NFL venues, and that is the absence of banners and retired numbers in the seating bowl. This team hasn't won any Super Bowl championships (one trip back in 1980), and there aren't too many NFL titles to brag about either. Their history is showcased in a great way in the building's atrium lobby. Touchdown "Fly Eagles Fly"... the team's emotional fight song is sung by EVERYBODY, and the adrenaline just rushes when the music plays and the team runs onto the field... E-A-G-L-E-S ... Eagles! Very very nice. Extra Point We've seen plenty of NFL venues with out of town scoreboards, but the Linc is the first that we've seen that includes the time remaining in the game as well as score, quarter and possesion. 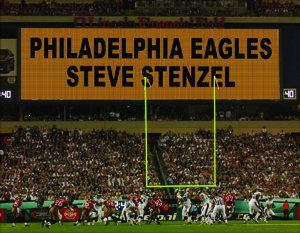 Fumble in that same vein, the Linc has a digital LED board on each sideline and a streaming dot matrix board at the base of the "Eagle Nest" yet they do not appear to be used to their fullest capabilities. How about some more special effects from the LED boards and maybe something else besides "Welcome to Lincoln Financial Field" on the dot matrix board.....some detailed in game stats there, perhaps??? Fumble to the overly passionate Philly fans who denigrate anyone or anything wearing a logo of a sports team that is not based in Southeast Pennslyvania. We get more nonsense here in Philly for wearing Sabres gear than anywhere else on the continent. Then again, is this really a surprise considering how Phillyfan can be towards their own teams?? Touchdown To the magic of the USRT karma....in the Eagles first four games here(two preseason games included) they go zero for four in the win column and are outscored to the tune of 89-31!!! Off we go to the rescue, as the Eagles hold off the Redskins' late charge to win by a 27-25 count. Touchdown To Eagles fans who have supported their team through thick and thin, enduring the wretched Vet and some horrible teams along the way. Season tickets make up most of the fan base (PSLs required in lower and club sections to boot) and fans here have snapped up all the single seats, making an Eagles ticket a hot item, year in and year out. Touchdown The Vet will be imploded sometime in February or March of 2004!! We want to extend our appreciation to Eagles staffers RON HOWARD, Director of Marketing and Communications and DEREK BOYKO, Manager Media Relations who both went the extra mile to make our visit a memorable one. (Assist to Sabres VP/Communications MIKE GILBERT for introducing the USRT to the Eagles front office). Ron and Derek are inducted into the USRT Hall of Fame with our heartfelt thanks. Joining the new generation of NFL venues, Lincoln Financial Field does not have the amazing view of a city skyline. It does not have a retro/nostalgic brick facade of a Camden Yards. What it does have is a design that focuses a lot of attention on fan friendly public spaces, gathering areas, and architecture that embraces the gritty and passionate Philadelphia sports fan. Walk into the Linc and you have more a feel of a bustling train or bus station or museum than a glitzy stadium. It is more like your neighborhood field, or your corner tavern, but all done with a dynamic flair, and has every fan friendly amenity to make your day complete. The Linc deservedly takes its place among the elite and great venues of the National Football League. Philadelphia, Pa. - A crippled economy has reportedly hurt the resale value for seat licenses at Lincoln Financial Field in Philadelphia. 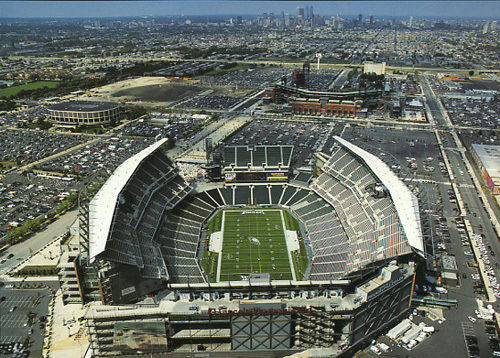 Before the stadium opened in 2003, the Eagles sold seat licenses for an estimated 29,000 of the stadium's 68,000 seats. The Eagles were able to sell $70 million worth of licenses during the initial sale. The team's success, though, and a booming economy created an open market that saw prices jump from an average of $2,233 in 2002 to $7,300 in 2007. An 8-8 record in 2007 partly accounted for a fall to $4,700. As of last week, brokerages have bartered 2009 Stadium Builder Licenses for an average of $3,800. Ticket brokers have benefited from the Eagles' winning ways and what was, a few years ago, a robust economy. Jeff Weinberg of Philadelphia-based Seatmeat Inc. said he owns more than 50 licenses. On his Web site, phillysbl.com, he deals mainly with Eagles SBLs. Bargain prices are good news for fans who want great season tickets and are willing to own seats as long as the licenses are more affordable. SBLs on the lower level at the Linc are selling for just over $6,000 at Season Ticket Rights. Two years ago, they cost nearly $8,000. Club-level SBLs are for the taking at $1,583, but there's a caveat. The season tickets for those seats, which went for $5,800 in 2007, are much more expensive. The economic plunge has forced many owners to liquidate what have now become luxuries. 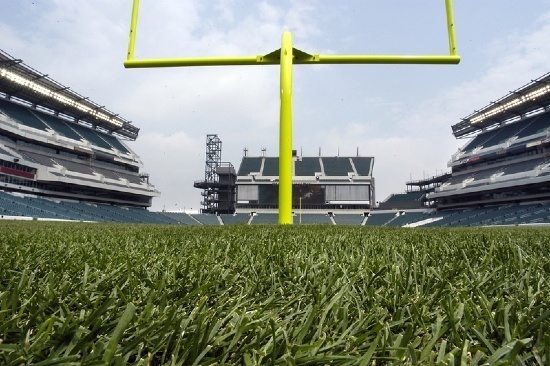 Philadelphia, Pa. - The Philadelphia Eagles want Lincoln Financial Field to be the "greenest" stadium in the world, the Philadelphia Inquirer reports. Come opening day next September, if all goes as planned, the upper rim of the stadium will be studded with 100 spiral-shape wind turbines. Some 2,500 solar panels will cover portions of the roof and facade, tilting south. In the parking lot, the Eagles will build a cogeneration power plant that can run on biodiesel or natural gas. Taken together, the Eagles say, the three sources will fully power any game, even as the stadium lights blaze, and the sound system blasts. In effect, the team will be off the grid, although the system will remain tethered to feed unneeded juice back into the grid, the Inquirer said. The Eagles say the plan also is good business. The team expects to save $60 million in energy costs over the next two decades. "We never really accepted the notion that to do great by the environment would not be a wise business practice, or too costly," owner Jeffrey Lurie told the newspaper. In the United States, at least 18 professional sports stadiums have installed some solar power. The Inquirer said nine more have been granted LEED certification, a green rating from the U.S. Green Building Council. Then there's Pocono Raceway, where a $16 million array of solar panels has led NASCAR to proclaim it the world's largest solar-powered sports facility. Lots more green upgrades are in the works. At least five more pro sports venues or organizations are considering going for an LEED rating. Comcast-Spectacor, owner of the Flyers and 76ers, is among them, company spokesman Ike Richman told the newspaper. The Eagles compost food, plant trees to offset travel, use organic fertilizers, and stock the concession stands with bioplastics. The team sends fryer oil out to be made into biodiesel, which comes back to fuel its equipment. In 2009, the stadium used 50 percent less energy than it did in 2003, Lurie's wife Christina told the Inquirer. Christina Lurie has pushed the team to be more eco-friendly. The Eagles' partner in the project is Solar Blue, an Orlando renewable-energy and energy-conservation company. The team is providing the real estate, while Solar Blue is installing, operating, and maintaining the equipment - an investment of up to $30 million. What makes it work for Solar Blue, in part, is that the Eagles have agreed to a 20-year contract to buy the electricity at a fixed 3 percent annual increase. The capacity of the plant will be 7.6 megawatts; the solar and wind together will add only .86 of a megawatt.